Undeniably, the appearance of a facility or storefront is critical for a business. Imagine walking on the streets of downtown Walnut Creek or 4th Street in Berkeley and seeing the clean windows of the boutiques. 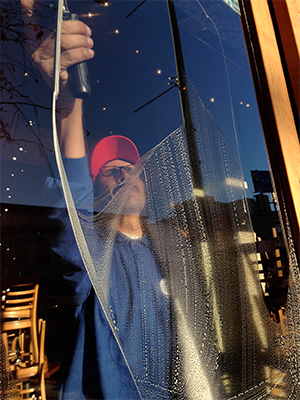 To enhance the appeal of their company, many business owners consider commercial window cleaning services a supreme solution. However, besides having crisp, clear windows that help improve your business’ image, utilizing the right skills and equipment of professional window cleaners comes with added benefits particularly appealing to managers and entrepreneurs. It goes without saying that a clean office is a healthy working environment. However, making sure the office windows are clean and free of dust particles and dirt that we often see accumulated in glass panes also helps employees stay healthy and protected against asthma and allergies triggered by these substances. Indoor air quality is a critical factor that affects employees’ health, their level of comfort, and ability to work. Alongside with poor ventilation and humidity, accumulated grime and dirt on windows contribute toward low indoor air quality and health problems. If employees are healthy, they are more willing to work; hence, more productivity. That aside, if they are released from responsibilities that include window cleaning, they can focus on their primary duties and perform their assigned tasks without any interruption for cleaning tasks. Finally, having to work in an environment full of clutter and dirt is counter-productive and affects employees’ spirits and emotional well-being, leading to more sick days being utilized throughout. Also, having clean and clear windows is pivotal during sale seasons, when people are shopping and want to see what products are displayed in the store from outside. This helps increase the productivity, efficiency, and sales in your store. Professional window cleaners use the latest safety procedures and technology which eliminate or significantly reduce the risk of property damage and, of course, injuries. That aside, windows on office buildings are exposed to a wide range of harmful substances. Amateur hired hands or untrained staff lacks the necessary tools and experience for this type of task. They also don’t have the knowledge base required to prevent accidents, such as breaking the glass of a window pane or falling off a ladder. Asking your untrained employees to clean the windows without knowing the basics as to how to protect themselves while doing so can also turn into a liability. Proper maintenance of a building, whether you lease or own it, is crucial when operating a business. With a professional window cleaner, you can ensure lease requirements are successfully met. Considering all the above, you reduce your cost instantly when you make sure your business’ windows are properly (and much safely) cleaned. With rent and other costs skyrocketing in the Bay Area, reducing costs through window cleaning will make a big difference in your savings. Having dirty windows in your home or office is depressing. When you have a clean and clear view of the outside world you feel uplifted. Appearances do play a vital role in determining the way we feel towards an organization, which, in turns, affect our purchase decisions. Cleanliness is considered a reflection of the business practices and clean and clear windows project an air of orderliness, sophistication, and, of course, class.